MINNEAPOLIS & REHOVOT, Israel--(BUSINESS WIRE)--Nov. 26, 2018-- Further bringing 3D printed medical models to life, Stratasys (Nasdaq: SSYS) is expanding the suite of printers and materials validated by its collaborator Materialise (Nasdaq: MTLS) as part of FDA-cleared Materialise Mimics inPrint software. The end result is the most versatile 3D printing system for point-of-care across hospitals and physicians - advancing production of patient-specific, life-like anatomical models for diagnostic purposes in conjunction with other tools and expert clinical judgement. 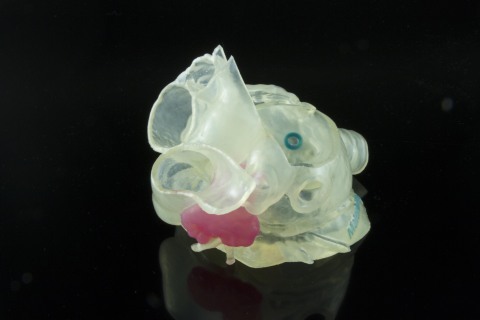 Model of patient's left atrial appendage (LAA) created with Stratasys and Materialise technology is intended to allow surgeons to select the appropriate device and plan the optimal approach to occlude the LAA. Image provided by Materialise. Materialise incorporates 27 years of 3D printing experience into a range of software solutions and 3D printing services, which together form the backbone of the 3D printing industry. Materialise’s open and flexible solutions enable players in a wide variety of industries, including healthcare, automotive, aerospace, art and design, and consumer goods, to build innovative 3D printing applications that aim to make the world a better and healthier place. Headquartered in Belgium, with branches worldwide, Materialise combines the largest group of software developers in the industry with one of the largest 3D printing facilities in the world. Further information at: www.materialise.com. Stratasys is a global leader in additive manufacturing or 3D printing technology, and is the manufacturer of FDM® and PolyJet™ 3D Printers. The company’s technologies are used to create prototypes, manufacturing tools, and production parts for industries, including aerospace, automotive, healthcare, consumer products and education. For 30 years, Stratasys products have helped manufacturers reduce product-development time, cost, and time-to-market, as well as reduce or eliminate tooling costs and improve product quality. The Stratasys 3D printing ecosystem of solutions and expertise includes: 3D printers, materials, software, expert services, and on-demand parts production. Corporate Headquarters: Minneapolis, Minnesota and Rehovot, Israel. Online at: http://www.stratasys.com/, http://blog.stratasys.com/ and LinkedIn. Stratasys is a registered trademark and J750, Objet30 Prime, and Stratasys signet are trademarks of Stratasys Ltd. and/or its subsidiaries or affiliates. All other trademarks are the property of their respective owners. The statements in this press release relating to Stratasys’ beliefs regarding the benefits consumers will experience from the Stratasys J750, Objet30 Prime 3D Printers or their validation with Materialise, Stratasys’ expectation on the timing of shipping the Stratasys J750, Objet30 Prime 3D Printers or their validation with Materialise, are forward-looking statements reflecting management's current expectations and beliefs. These forward-looking statements are based on current information that is, by its nature, subject to rapid and even abrupt change. Due to risks and uncertainties associated with Stratasys' business, actual results could differ materially from those projected or implied by these forward-looking statements. These risks and uncertainties include, but are not limited to: the risk that consumers will not perceive the benefits of the Stratasys J750, Objet30 Prime 3D Printers or their validation with Materialise to be the same as Stratasys does; the risk that unforeseen technical difficulties will delay the shipping of the Stratasys J750, Objet30 Prime 3D Printers or their validation with Materialise; and other risk factors set forth under the caption “Risk Factors” in Stratasys' most recent Annual Report on Form 20-F, filed with the Securities and Exchange Commission (SEC) February 28, 2018. Stratasys is under no obligation (and expressly disclaims any obligation) to update or alter its forward-looking statements, whether as a result of new information, future events or otherwise, except as otherwise required by the rules and regulations of the SEC.